A fine of up to $1,000, six months in jail, or both. A fine up to $200. Is only a good idea when you are slowing down. Is not a good idea. You should pay attention to the traffic in front of you. Will help you know if you are being followed by a tailgater. 3. Which of the following vehicles must always stop before crossing railroad tracks? A motorhome longer than 40 feet. A truck towing a boat trailer. 4. You want to park downhill and there is no curb. Which way do you turn your front wheels? Parallel to the side of the road. Toward the center of the road. Continue driving since the pedestrian must give you the right-of-way. Make the pedestrian aware that he is not using a marked crosswalk. 6. 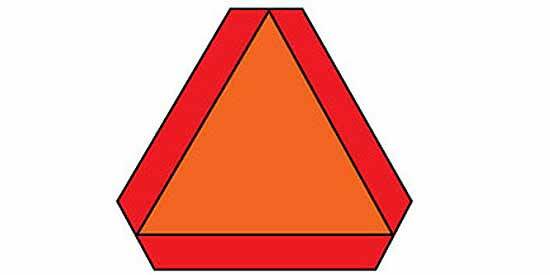 Which of the following is one factor that greatly affects your stopping distance? Type and condition of tires. Type and condition of brake lights. Type and condition of air bags. Type and condition of safety belts. Unless you have the right-of-way. Unless some of the cross traffic can get around you. Illegally share lanes with motor vehicles. Are entitled to share the road with you. Is transporting a hazardous load. Is moving slower than normal. Is required to stop at all railroad crossings. Reduce your speed to 30 mph or less. 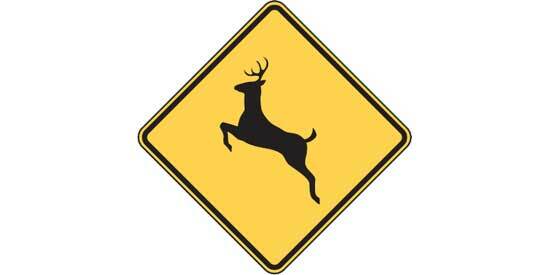 Be alert for possible animals in or near the roadway. Is against the law, unless you can hear other sounds from a distance of 100 feet. Is allowed if you drive with windows open. Is allowed in residential districts. 13. You approach an intersection with a stop sign. Where must you first stop? At the crosswalk or limit line. Out far enough to see cross traffic. You want to pass another driver. You want to make a U-turn. Faster drivers want to pass you. 15. When are you allowed to drink alcohol while driving? When you drive outside city limits. When you are 21 years or older. When your blood alcohol concentration is less than .08 percent. 16. What is a no-zone in terms of driving? An area designated for pedestrians. A work zone where driving is prohibited. A zone where passing is not allowed. Blind spots around large vehicles. When there is a big enough gap in traffic. After coming to a complete stop. Immediately, as you always have the right-of-way. 19. Can you make a U-turn at an intersection on a green arrow? No, unless there are three lanes or more in each direction. Yes, unless a No U-turn sign is posted. 20. What is true about signaling at freeway speeds? Start signaling when you move into another lane. Signal at least five seconds before you change lanes. You do not have to signal if you do not see other vehicles around. You never have to signal on a freeway. Reduces the risk of collisions. Can frustrate other drivers and trigger road rage. Not drive in the motorcyclist's lane. Keep two feet between your car and the motorcycle. Share the same lane if the speed limit is 35 mph or less. 23. What distance should you keep from an emergency vehicle on its way to an emergency? The vehicle you are passing is signaling a right turn. There are two or more lanes in the same direction. There is a broken yellow line on your side. 25. You reach an uncontrolled intersection at the same time as a driver on your left. Who goes first? Whoever is signaling to make a turn. The driver on your left goes first. 26. If your vehicle stalls in the path of an oncoming train, you should run away from the tracks and move in which direction? In the direction you were traveling. In the same direction as the train is traveling. Slower traffic must move to the right. Lane change is not allowed. Traffic lane will end ahead. Drive to the side of the road and stop. 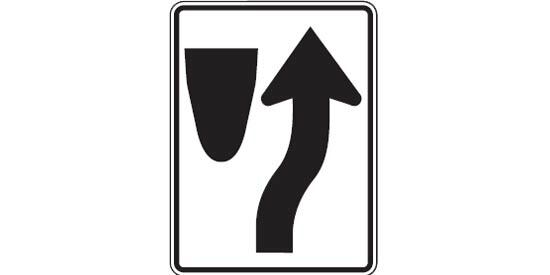 Merge left and drivers in the left lane should allow others to merge smoothly. Drive slowly and carefully since there are several curves ahead. 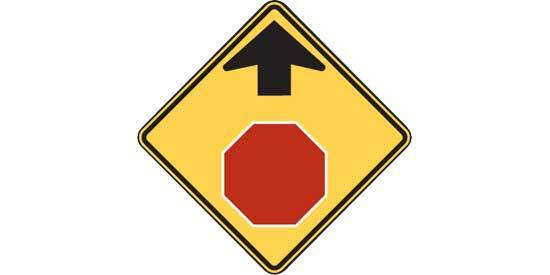 Slow down and be ready to stop at the stop sign ahead. California Permit Practice Test - 7 You got %%score%% correct answers of %%total%%. %%details%%. How Many Questions on this Practice Test? This CA DMV practice test has 30 questions, which is a little less than the real DMV test, unless you are already licensed and need to take the knowledge test again (the re-examination test has 18 questions, half of the real test for adult drivers). If you are under 18 years, the permit exam has 46 questions. If you are 18 or older, the written exam has 36 questions. The vision test (if you wear eyeglasses or contact lenses, bring them with you). A road test or “behind-the-wheel driving test”. You must make an appointment to take the road test. 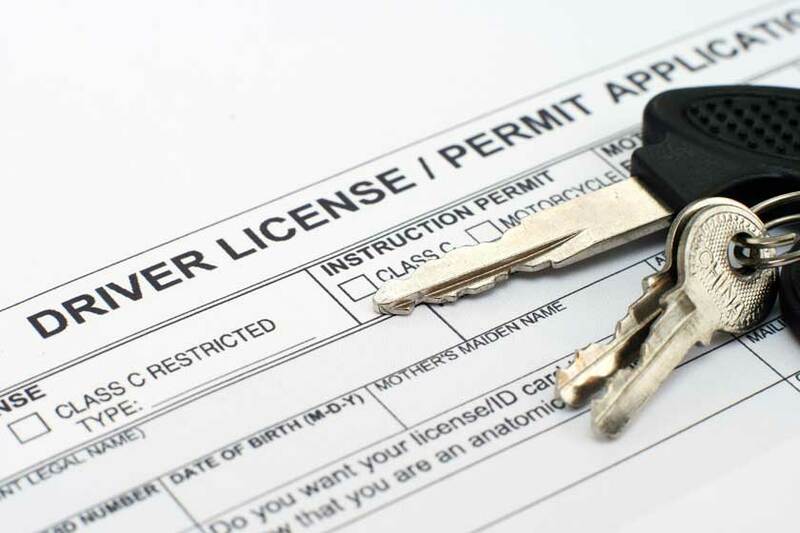 It is waived if you hold a License from out-of-state or a U.S. territory. Remember, after paying the application fee, you can take the knowledge test 3 times. Should you fail your third attempt, you must start all over by handing in a new application and paying the fee again. So, it is a good idea to take as many practice tests as you can before you head down to your local DMV office. Feel free to take the practice test several times here or at Driver’s Prep. When users pass several practice tests with a score of 92% or more, it is rare for them to fail the real driver license test. Don’t just memorize the questions in the practice tests. Use test questions and answers to see what topics need your attention. In other words, try to fully understand the meaning of the questions and not just that “the question about passing a motorcycle” has option “B” as the correct answer. Be the first to comment on "California Permit & License Test – 7"